No matter what your financial situation is, a kitchen remodel project is always a burden. While we all want to save the most money on our home renovations as possible, no one likes the idea of sacrificing quality, aesthetic or layout. Not to mention, renovation costs can vary based on the contractor and/or designer you choose. In 2019, homeowners will spend anywhere from $12,594 to $33,118 on kitchen remodeling, at an average of $21,751, according to HomeAdvisor. You were probably hoping it wasn't that much, but thankfully, there are affordable ways to redo your kitchen with all these factors in mind. So, if you're wondering how to keep within your budget and still achieve YOUR ideal kitchen space, you've come to the right place. Sometimes the smallest detail can cost you thousands of extra dollars when it comes to switching up your kitchen. That's why we recommend getting multiple quotes from different kitchen designers near you. Whether you have the luxury of using your own kitchen contractor or plan to do the work yourself, getting several price comparisons on materials will help you in the long run, too. Shopping around can also be elemental when it comes to your timeline. If you have a goal date in mind to complete your kitchen project, it's probable that certain designers and/or contractors will be able to adhere to it, and some will not. This is an important one. 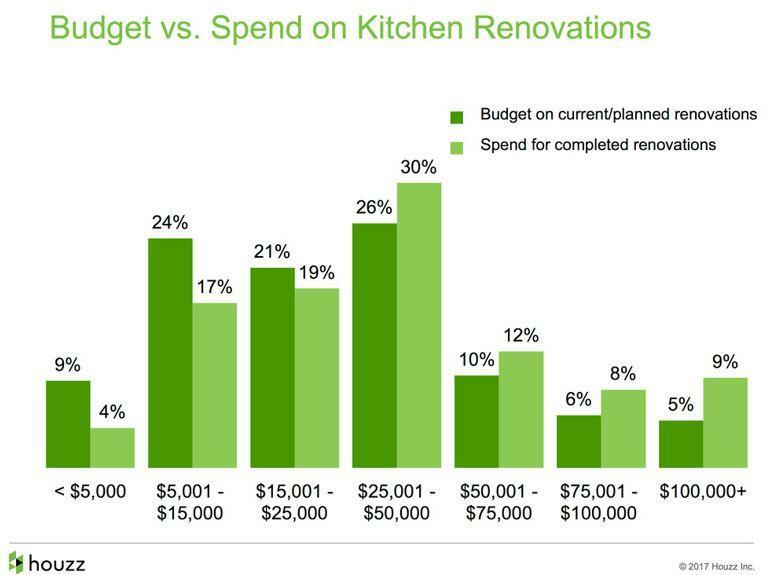 Before you even start to daydream about subway tile backsplashes or your new pantry cabinet, you need to set a budget for your kitchen renovation project. If you choose not to and ultimately tell your kitchen designer or contractor a ballpark figure of where you hope to end up, chances are you'll spend way more than anticipated. It's easy to say you're comfortable with adding a few bucks here and there until that hefty bill comes! Going into the process with a hard number will help all the parties involved guide you when choosing all the components that will make up your soon-to-be dream kitchen. The best part? You might even have some extra bucks to accessorize your countertops or cook your first meal in your new space! Hey, don't throw that away! When you think of renovating your entire kitchen, you probably assume that everything needs to be refreshed, and therefore replaced. However, that's not always the case. Before you throw your old sink in the garbage, ask yourself if you'd be happy with just upgrading your faucet and handles instead? Or maybe it's imperative that your cabinets, countertops and floors are swapped out to complete your design, but your appliances are okay to stay - for a while at least. We also suggest selling your salvageable materials and old kitchen items. Craigslist, Facebook Marketplace and phone apps like LetGo will quickly become your best friend when you realize people will actually pay you for your used stove and tiles. We know the thought of your kitchen (arguably the room you spend the most time in) torn apart, upside down and inside out is not the most pleasant. No one wants to breathe in dust or hear the lovely sound of hammering on a Saturday morning. However, if your contractor or designer allows you to stay in your home while your kitchen renovation is in progress, you'll most likely benefit in the long run. Spending weeks with a family member can be a headache, and hotel rooms are not cheap these days, so just try to just rough it out and remain in your home, if possible. It'll all be over before you know it! Well, what are you waiting for? Go get that kitchen you deserve!